“What’s the lowest temperature WEST SYSTEM Epoxy can be applied?” During cold weather, this is a common question our Technical Advisors are asked. Fortunately, it’s one we’re well equipped to answer. 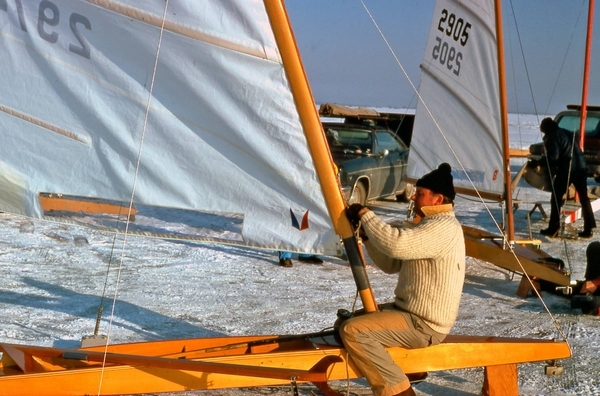 Gougeon Brothers, Inc. got its start in the world of DN Iceboat racing. Both Meade and Jan Gougeon have won multiple DN cup races worldwide. It’s not unusual for an iceboat to need repairs mid-regatta, so part of the discipline of iceboat racing is getting epoxy to cure despite cold working environments. The trick is using strategies that bring epoxy temperatures up to adequate cure levels in cold working environments. Use WEST SYSTEM 105 Resin and 205 Fast Hardener. 205 Fast Hardener is formulated to cure well at temperatures as low as 40°F (4°C), but this does require an extended cure time before removing clamps or sanding. 206 Slow Hardener and 207 Special Clear Hardener should not be used below 60°F (16°C) unless you elevate the working temperature to allow the system to cure properly. For best results when clear coating with 207 Hardener, postpone coating until the temperature in your working environment is around 70°F (21°C). 209 Extra Slow Hardener should not be used below 70°F (21°C). Warm resin and hardener before using. Cold temperatures increase the viscosity of the epoxy, making it more difficult to dispense, mix and apply. Warming the resin and hardener lowers their viscosity, allowing the product to flow through the dispensing pumps better, cling less to the containers and mixing equipment, and blend more easily for thorough mixing. The warmer, lower-viscosity mixture will flow more smoothly during application and penetrate porous surfaces more efficiently. In any case, you will want the resin and hardener at a temperature between 70°F and 90°F (21°C to 32°C). These methods keep the warmed resin and hardener close to your work and allow less time to cool off between dispensing and application. Warming the epoxy helps the initial chemical reaction get off to a better start, and results in more cross-linking even if the mixture cools when it is applied to a cold substrate. Dispense resin and hardener at the proper mixing ratio only. Altering the amount of hardener will seriously compromise the epoxy’s ultimate strength. WEST SYSTEM 300 Mini Pumps are designed and calibrated to dispense the correct ratio—one full pump stroke of resin for every one full pump stroke of hardener. If you are not able to warm the resin and hardener, do not use excessive force when dispensing. Keep steady pressure on each pump and allow each pump head to make a full stroke down and a full stroke up. Remember, the resin and hardener become thicker and more difficult to pump when they are cold and require significantly more time to return to the top of the stroke. Stir the resin and hardener thoroughly in a small pot, and allow more time before applying. Mix the resin and hardener for at least two minutes, scraping the sides and bottom of the mixing container. Use a mixing stick shaped to reach the corners of the pot. A smaller diameter mixing pot increases the chemical reaction between resin and hardener because its limited surface area prevents heat from dissipating too quickly. If you are unable to pre-warm the resin and hardener, allow some induction time. This simply means letting the mixed resin and hardener stand in the pot for several minutes, then stirring it again before using. This helps get the chemical reaction started, and the exothermic heat the epoxy generates will reduce viscosity making the material easier to apply. Warm the substrate as much as possible. The epoxy will thin out as it is applied to a warm substrate. It will flow out much more smoothly and penetrate better, resulting in a stronger bond. You can warm a repair area with heat lamps, hair dryers or hot air guns. Small components or materials such as fiberglass cloth can be warmed in a hot box (as described in section 2). Larger areas can be warmed by tenting the area and adding a portable heat source. Avoid unvented open-flame heaters that burn kerosene or fuel oil. Unburned hydrocarbons may contaminate bonding surfaces, and elevated moisture and CO2 levels can contribute to the formation of amine blush. Catalytic heaters do not appear to pose a problem unless they are used in a confined space such as an unventilated curing tent or box. To prevent temperature-related moisture contamination, be sure you’re working in ambient temperatures above the dew point. Your local weather resources will provide the dew point temperature based on relative humidity. Prepare cured surfaces carefully between applications. When coating at cold temperatures, the slower cure can result in the formation of an amine blush on the surface. The blush feels like a waxy/greasy film on the surface of the cured epoxy. Wash the surface with warm water using a 3-M Scotchbrite™ pad before applying subsequent coatings to a cured surface. Don’t let the water evaporate. Dry the surface with plain white paper towels. Sand any remaining glossy areas with medium grit sandpaper. Allow additional cure time before removing clamps or stressing joints. 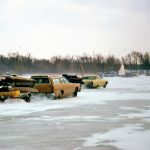 As a general rule, double the cure time for every 18°F (10°C) drop in temperature. Allow additional cure more than the 18°F (10°C) rule for pre-stressed joints, such as bent laminations and joints that will be subject to high loads. Elevate the temperature of partially cured epoxy. Elevating the temperature of the epoxy after initial cure can help to complete the epoxy mixture’s cross-linking and boost the epoxy’s physical properties even after a week at cold temperatures. Elevate the temperature of the epoxy and substrate gradually to avoid thermal shock. Although any temperature elevation will improve cross-linking, try to boost the temperature to 72°F (22°C) or warmer. The time required for final cure depends on the hardener used and the temperature the epoxy is exposed to. Generally, higher temperatures require shorter cure times. Do not exceed 140°F (60°C) and do not remove clamps or load the joint until the epoxy has cooled. CAUTION!—Heating a porous material may cause air within the material to expand and “out-gas.” Allow the epoxy to reach a partial cure before elevating the temperature. If an epoxy coating applied over the material has not gelled, bubbles from the out-gassing material may show up in the cured coating or glued joint as it warms. In some cases, your shop will naturally warm itself enough to complete the cure during the day, following a cold night. Outdoors, building a plastic tent to trap heat can easily boost the temperature enough for the epoxy to cure. Turning up the thermostat, using radiant heaters, electric heaters or electric blankets are the most common way to control the cure temperature in a shop. It is not necessary to heat the entire structure if you are working on only a small area. Tents of plastic or insulated board are very helpful for confining heat to specific areas and provide greater mobility with a limited heat source, both indoors and outdoors. It is best to store WEST SYSTEM materials above 35°F (2°C) with the container caps screwed down tightly to avoid moisture contamination. The containers can be stored with the 300 Mini Pumps left on them. After a long storage, verify the metering accuracy of the pumps. Repeated freeze/thaw cycles of the 105 Resin may cause crystallization. However, the formation of crystals does not permanently harm the epoxy, and they can be dissolved easily. Place the open containers in water warmed to 125°-140°F (52°-60°C) and let the resin come up in temperature. Stir the resin with a clean stick until all the crystals have melted and the liquid becomes clear. Remove from the water, replace the lids tightly and invert the container to melt any crystals which may be clinging to the top of the container. If the resin has crystallized inside the mini pump, pumping warm resin through it should dissolve them. Leaving the pump in the can while heating should clear the pump, too. 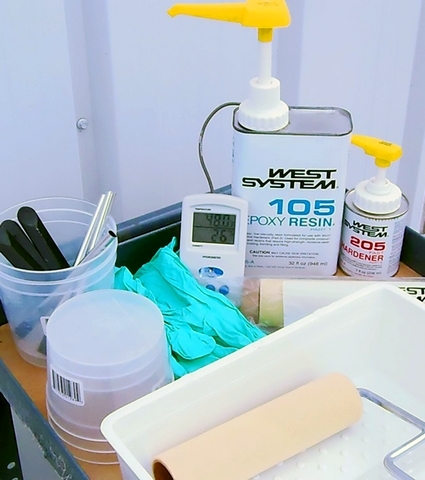 With a little advanced planning, and observing the precautions listed above, you can get WEST SYSTEM Epoxy to cure reliably in cold working conditions. 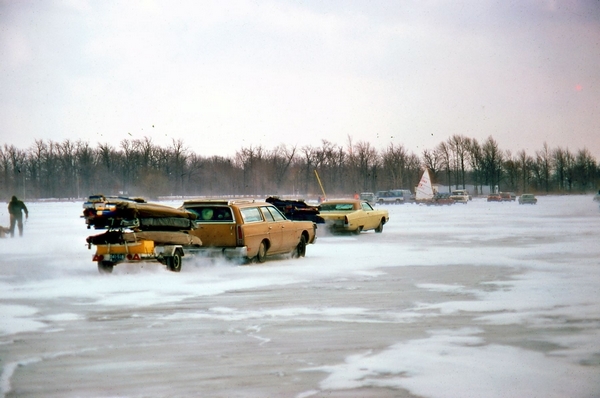 Since the 1970s we’ve been using these techniques to assure dependable epoxy bonds throughout our frigid Michigan winters. 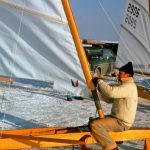 This entry was posted in Iceboats, Shop Tricks and tagged #43, cold temperature, cold weather, DN Iceboats, Don Gutzmer, Epoxyworks #43, Fall 2016 on August 20, 2016 by ewadmin.